DAZZLING 1946 Original Photo MARILYN MONROE - NORMA JEAN by ANDRE de DIENES RARE Doubleweight "VINTAGE" Andre de Dienes Exemplar! From the Shirley de Dienes Collection. 75" x 9.75" Antique Gelatin-Silver. An EXCEPTIONAL, Vintage 1946 Original Photograph of a young Marilyn Monroe as captured by renowned Hungarian-American photographer Andre de Dienes. This antique photo originates DIIRECTLY from Shirley de Dienes, Andre's widow and were personally obtained by her close friend and our consignor. Born in Transylvania in Austria-Hungary, de Dienes shot for many prestigious publishers including the Associated Press, Esquire, Vogue and Life magazines. In the mid-forties Dienes met the nineteen-year-old Marilyn Monroe (then called Norma Jeane Baker) who was a model on the books of Emmeline Snivelys Blue Book Model Agency. He became one of the first photographers to shoot the girl who would become the most famous woman of the 20th Century. The two would collaborate on several photo shoots until their last in 1961. 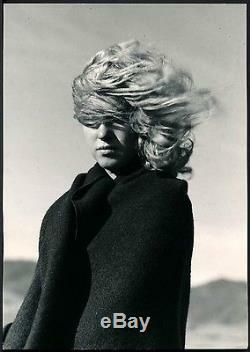 The offered photograph is a striking example that illustrates the fragility of the young Norma Jean with a gust of wind blowing her hair. This is also one of the EARLIEST images captured of Marilyn ever and was shot by Dienes in the 1946. And most importantly, the offered photo is a period 1940's exemplar from Dienes that was made in the 1940's by his own hands! The photo is a doubleweight example from his estate and comes with unmatched provenance. Unlike many of the later-issued restrikes that are made on newer paper, our offered exemplar is a true "vintage" 1940's specimen and has several credit stamps used by Dienes over the years. Our offered photo is in outstanding excellent condition and boasts striking contrast and crisp clarity. Simply put, this is an extraordinary Marilyn Monroe photograph for the finest of Monroe collections. Thanks in advance for your professional courtesy and cooperation. "Please allow time for images to load". We are collectors, dealers, authenticators and conservationist of fine vintage photography and memorabilia for over 30 years and have handled some of the world's finest photographs. If you have never bought from us, please give us a try and join over 30,000+ customers. Your satisfaction is always guaranteed! We will NOT end auctions early. This is to give everyone a fair and equal chance to win. Check out my other items. Be sure to add me to your favorites list. The item "DAZZLING 1946 Original Photo MARILYN MONROE NORMA JEAN by ANDRE de DIENES" is in sale since Thursday, August 04, 2016. This item is in the category "Entertainment Memorabilia\Movie Memorabilia\Other Movie Memorabilia". The seller is "hyee_auctions" and is located in Jersey City, New Jersey. This item can be shipped worldwide.